This is another long-forgotten title from the MARVEL UK back catalogue: a comic based on the animated THE REN AND STIMPY SHOW which was, briefly, a flavour of the moment way-back-when. Published four-weekly, this first issue hit British newsagents in September/ October 1994. 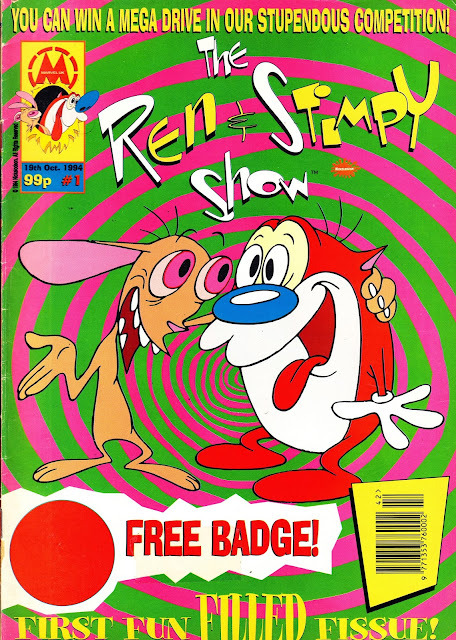 I have no idea how long the British edition ran for but the US edition, which supplied the material, ran for an impressive 44 issues between 1992 and 1994. The TV show ran on BBC TWO. It only ran for a mere 16 issues, of which I own them all. The last issue was published on 27th December 1995, and the last page even has Dr. Stupid bidding farewell! I still have the other 14 mind.